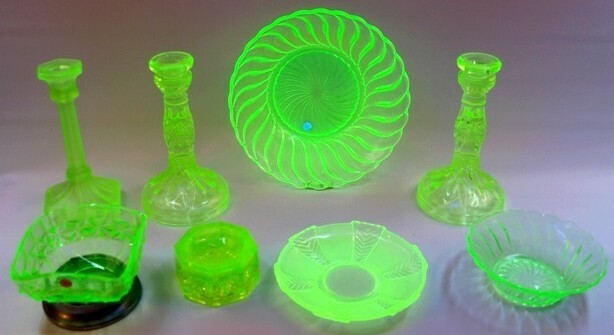 So, what is Uranium Glass all about? It’s all in the name, though it is also widely known as Vaseline* and Depression* glass. It has been made since the mid 19th Century, though production really took off from the turn of the 20th Century until the outbreak of the Second World War. The key point is that during manufacture small amounts of Uranium Dioxide were added to the molten glass.This gives these items a characteristic green or yellow colour, and a very distinct lustre, or fluorescence, which becomes especially noticeable, as a bright green or yellow glow under ultra violet light. The Uranium Dioxide content is generally very low, typically less than 2 percent by weight, (though it can be higher). Uranium glass is generally regarded as harmless and not subject to any special handling precautions, nor are there any restrictions as regards owning antique and vintage Uranium glassware (in the UK and most other countries). Nevertheless, we recommend that these objects are not used for storing or serving food and, like any fragile glass objects, should be kept well away from children, not because it is radioactive but broken glass can be very dangerous! * Vaseline refers to the milky yellow appearance of some types of Uranium glass and large amounts of cheaply made items were produced in the US during the 1930’s Depression era.